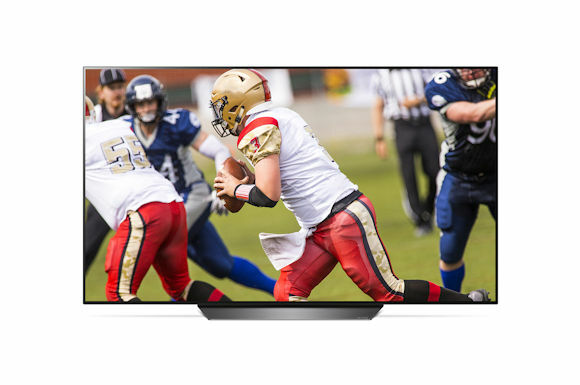 The Super Bowl is right around the corner, and LG Electronics is ready to make your party for the big game a hit by offering limited-time promotion on one of its entry LG OLED 4K Ultra HD TVs. Now through Feb. 2nd, LG is offering its 55-inch B8 4K OLED TV for $1,496.99, which is $800 below the original price of $2,299.99, and the 65-inch B8 for $2,296.99, which is $1,000 off the original $3,299.99 selling price. The promotion will be available at authorized LG retailers nationwide. The 2018 LG OLED TVs feature LG’s webOS smart TV platform along with AI ThinQ technology for easy content discovery and control using natural voice commands. This includes support for Google Assistant built in, to control compatible smart home devices, search for content or information and easily control the TV with spoken commands. LG TVs with AI ThinQ also “work with Amazon Alexa” devices. The offer on the LG B8 series models represents “the lowest pricing ever for LG OLED TVs in these screen sizes,” the company said. OLED technology produces some of the deepest black levels available in a consumer television today. This is important for giving images a greater sense of depth while giving colors deeper tones. The panels are also virtually free of blooming or haloing of bright objects on black backgrounds. All 2018 LG OLED feature 4K Cinema HDR, with support for all major high dynamic range formats including Dolby Vision as well as HDR10 and HLG, both with LG’s advanced tone-mapping technology that provides scene-by-scene optimization. Thanks Greg. Great deal even though C8 and E8 series have been on sale recently at various vendors. I sometimes wonder if those vendors (e.g. PC Mag Reseller and some Amazon Resellers) are authorized dealers because of their rock bottom prices. Anyway, I’m interested in purchasing this model and thank you for the heads up.